One unconventional type of investment is to buy abandoned houses—called akiya in Japanese. These houses are very cheap, going for almost nothing. There are more than eight million such distressed or abandoned properties in Japan. You can find great deals on these places very quickly at relatively small risk, but you have to find the right property in the right location. I’ve even seen listings for houses in Kobe, which has a population of more than one million, going for half a million yen (US$5,000). However, akiya generate huge social issues related to safety, such as fire, weeds, pests and burglars, not to mention the effect on neighborhood property values. If you can find one of these properties and flip it into apartments, for instance, you can make some money. 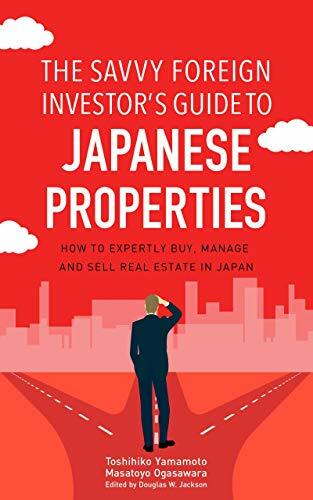 The big attraction is that your initial investment is so low, say half million yen for a house and land as close as twenty minutes from a station. That’s the beauty of property investment. It’s a real asset, but a lot depends on the seller’s circumstances. Even if the property has a value of five million yen, because they are desperate they’ll dump it for virtually nothing. If you’re savvy and look for such opportunities, you’ll find a property with unique attributes. You could even convert it into a Seven-Eleven shop or a parking lot and make money. As I said in an earlier chapter, in the real estate business you generally make your money when you buy a property, not when you sell it. That’s because if you don’t buy the property at the right price and/or terms, you won’t make a solid profit when you sell it. This is especially true for investors hoping to flip a property, taking into account the high transaction costs. House flipping in the U.S. is usually viewed as a short-term strategy—buy and renovate a place, and then sell it at higher value. A flipper usually needs to get out in less than six months. In Japan, however, this is not a common practice. As an alternative, I’d propose buying and flipping akiya into rental properties. These places are naturally very affordable, and one of our business partners is actively investing in akiya. Here’s a simple strategy we recommend for this. We look for properties in suburban areas of Tokyo. There are similar places in Kansai (western Japan), but we don’t cover those areas because it is too far to visit the sites. The key is selecting a property where you can expect stable demand for housing, meaning a region with a reasonably concentrated population base. You don’t have to worry about the distance from the station in suburban areas, by the way, because unlike people in big cities, most residents commute by car.